Out of the shadows and into the light - Adobe Lightroom shows its face to what should have been the unsuspecting world of digital photography. The formal announcement was due during Macworld San Francisco. However, the news broke on an Apple rumour site on Friday 6 January. Anyway, enough said about what should have been. I would love to be able to say that I've been using Adobe Lightroom for many months, but I can't. Actually, at time of writing this Preview I've had a copy for about 48 hours. That said, I've been aware of Lightroom (codename Shadowland for those into that sort of thing) for the best part of 12 months, and was given access to a preview video in early December 2005. Over this period I have participated in on-line focus groups, and like a few other Photoshop CS2 and Bridge beta testers I was asked to provide prioritised feature wish lists. Obviously at the time most of us had no idea of the use to which the information would be put. I mention all of this for a number of reasons, but not least of which is to dispel any notion that Lightroom is Adobe's rushed alternative to Aperture. 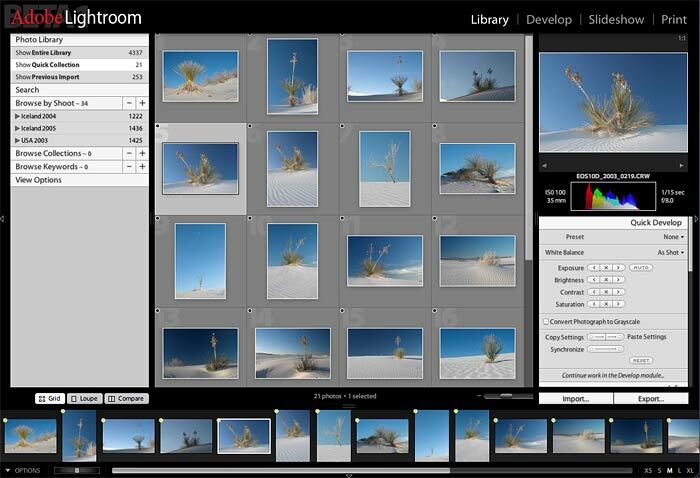 As a matter of fact, Lightroom has been an ongoing project at Adobe for a long time. Furthermore, Lightroom is not a pre-bound version of Bridge and Camera Raw. Lightroom lacks many of the features required for efficient multi-format file management found in Bridge, but on the plus side, it provides the much sought after off-line storage feature that is currently absent from Bridge. It also includes a much more comprehensive array of colour and tone correction tools than Camera Raw 3. Nevertheless, it is important that I stress the point - Lightroom is unfinished; i.e. there are many features still to be incorporated. The application described below is actually much closer to late Alpha than early Beta. You're getting a chance to see it now because Adobe wanted its customers to see what the future holds, and they want your feedback. 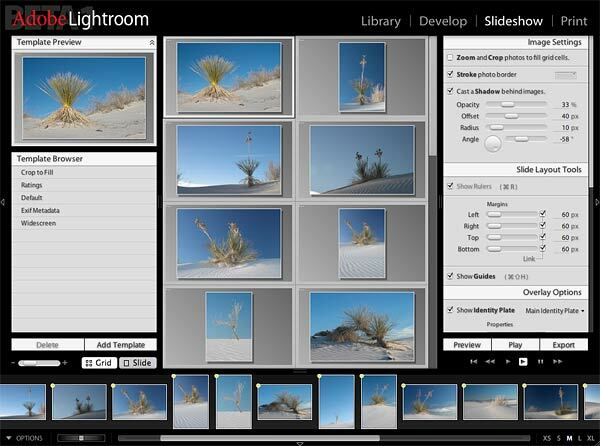 Adobe Lightroom Public Beta 3 has been released. This new version contains a fair number of new and enhanced features, so I've written a review article to cover the changes. 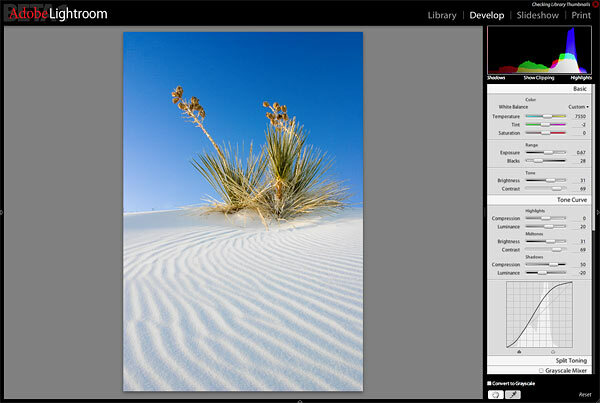 Adobe Lightroom Public Beta 3 for Windows has been released. Other than the omission (temporary) of the Web module Windows users should find the feature set is broadly similar to that found in Mac Beta 3. However, I've also put together a short review specifically for Windows users, which can be found here. Lightroom is designed to provide digital photographers with an efficient, powerful way to import, select, develop, export, print and showcase large numbers of digital images. It allows photographers to spend less time sorting and organising their images, thus giving them more time to actually take and edit the images. It was designed from the ground up using a high level scripting language. Since its modular architecture is intended to allow greater flexibility than most of the current alternatives it should allow additional features (includes those from third parties) to be easily and quickly integrated. When you first open Lightroom you'll be presented with a dialog called "Five Rules". The first four rules give a quick overview of the Lightroom workflow, the fifth I'll leave until later. The workflow for this Beta is relatively simple to follow, comprising of four steps: Library, Develop, Slideshow and Print. Over the next couple of pages I'll briefly cover the key points of each module. The Library is the location in which all your folders and images are stored. It also contains a Search facility, a method for creating Collections, plus areas for Keyword and Caption input. 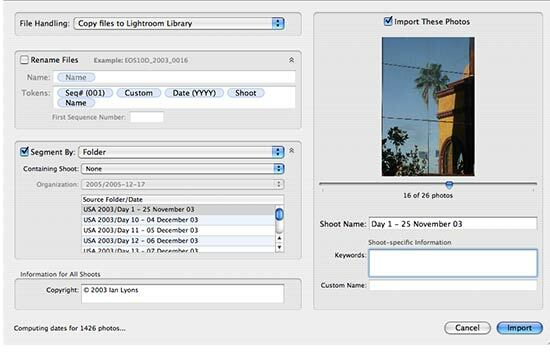 Using the special Import dialog you'll find that importing either new or existing image libraries into Lightroom is fairly straightforward. With Lightroom you have four import options: leave the images where they are (i.e. reference them), move them to a centrally managed library, copy them to the managed library, or convert them to DNG on import to the managed Library. The Import module also allows you to rename the images on import, but only on into the managed library. Renaming of referenced images is not yet supported. This highlights an important distinction between Lightroom and Bridge - in Bridge you can easily rename an image or images at any time whereas Lightroom only allows you to rename the images as part of the import/export process. Unlike Aperture, Lightroom libraries are not written into special packages or even the much criticised unitary database. With Lightroom you can access your images via the Finder in exactly the same way as you've always done. 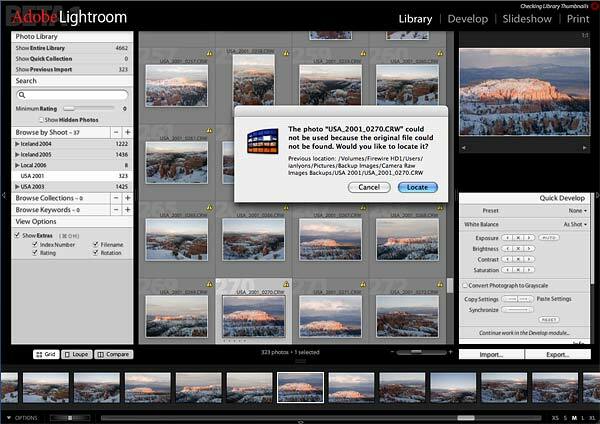 Actually, you access the Finder from within Lightroom itself, which makes finding files, images, templates very easy. Images can be imported into self-contained libraries called Shoots or placed in the main library. Whilst an image can only ever be in one Shoot it's perfectly possible to have the same image appearing in more than one Collection. Likewise, Lightroom will not allow you to import the same image a second time. If an image has somehow been corrupted or needs to be replaced for some reason then you'll need to delete the original version and it's associated index file. A really nice feature of Lightroom is the ability to browse all of your images in one window (i.e. view your entire image library). 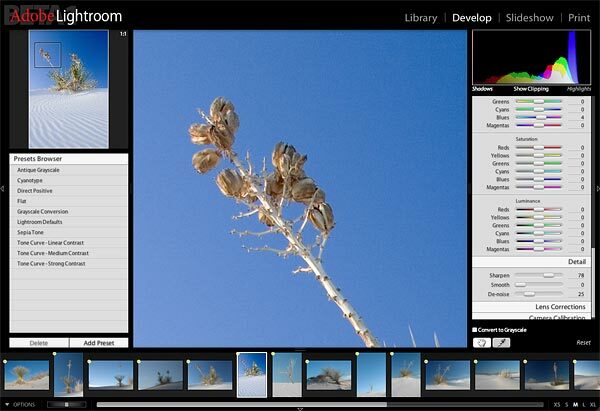 This is achieved by selecting the option Show Entire Library from the Photo Library panel. Using Collections something similar can be done in Bridge, but it's nowhere near as fast or smooth. Importing images and building the series of preview thumbnails associated with each image can take a long time in Lightroom, but this is a temporary issue that Adobe hope to resolve some time in the near future. Even so, Lightroom will generate high quality preview images very quickly once an image or group of images is selected. Obviously a higher priority is given to selected images, but Lightroom still works away in the background. Compared to Bridge you should find that scrolling through the thumbnails is very fast, likewise the speed at which the larger preview images appear. As you browse through the library you can also Rate images, place them into Collections, etc. The Library module also has a panel called Quick Develop in which you can select an alternative White Balance and/or development Preset. It also allows you to make fairly crude adjustments to: Exposure, Brightness, Contrast and Saturation. The left and right pointing arrow buttons are used to apply step changes (i.e. exposure increase/decrease is equivalent to EV 0.33 and the remainder +/- 10 units each time button is pressed), whilst the X button is used to reset the control. The Auto button only applies to Exposure. Other than the Histogram and the actual image there's no other feedback. I'm sure that once users establish how the button controls actually work they'll ignore Quick Development. In the meantime, readers of this site will have the jump on them. Another bone of contention with many Bridge users is the fact that it does not provide a means of locating or accessing images that are stored off-line (i.e. a disk drive or DVD that's not currently available on your computer). 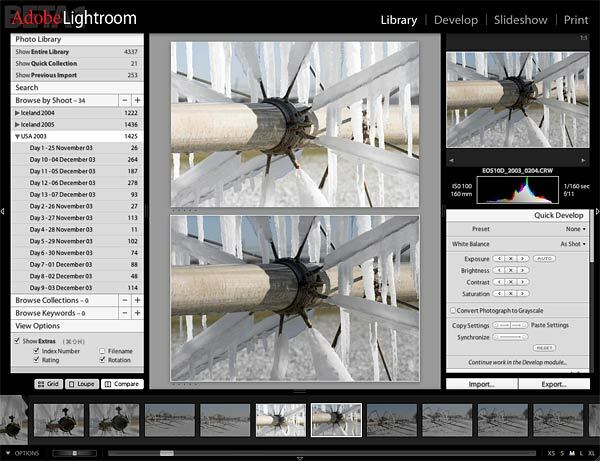 With Lightroom this issue has been substantially addressed. As can be seen in the screen-shot shown above Lightroom initially identifies such images by a yellow alert badge ( Beta 3 uses the "?" symbol - Click here for an explanation on how it can be used). Furthermore, if you attempt to edit an off-line image a dialog appears to tell you the last know location of the image along with an offer to locate the image. Once you connect the disk drive or insert the relevant DVD Lightroom very quickly locates the image, thus allowing you to begin the process of editing the image. Whether this will meet the needs of users with 100's of thousands of off-line images is another matter. February 2006 - Rotate, Crop and Straighten tools added in Lightroom Beta 2. OK, so the Tone Curve tool looks different, it is different, very different! In many ways the new Tone Curve tool is a vast improvement over the same tool in Camera Raw, that is except that there is no way to pick a point on the curve and drag. The only way you can manipulate the curve is via the slider controls for Compression and Luminance. There are a total of six sliders, two each to control the: Highlight, Midtones and Shadows. Not withstanding the fact that the sliders provide a method of control not previously seen in an Adobe application I expect that, over time, most users will get used to this arrangement. Of course there's also the built-in highlight/shadow Clipping Controls (also known as range sliders) that go with curve adjustment (hold down the Option/Alt key whilst dragging the little triangles on the bottom axis of the graph). Also, whilst I'm waffling about clipping controls I should mention that activating the Clipping Display on the Histogram requires that you click the word Highlights or Shadows. Other than that they work like they do in Camera Raw 3. I mentioned 100% previews when discussing the Library module but skipped on the detail. I think Adobe have done us really proud in the way they've implemented the Loupe feature. OK, so it's not as cool looking as the loupe in Aperture but it is faster, and it doesn't get in the way of the image. So now we get to the new tools, the really cool tools, the tools that we should have had all along. So what tools are these? HSL Color Tuning, Split Toning and Black & White. HSL stands for Hue, Saturation and Luminance. It's a tool I found almost indispensable in LaserSoft SilverFast. OK, so many don't like editing in HSL mode, but for me it means that I can fine tune specific colours in the RAW image rather than wait until later in Photoshop. 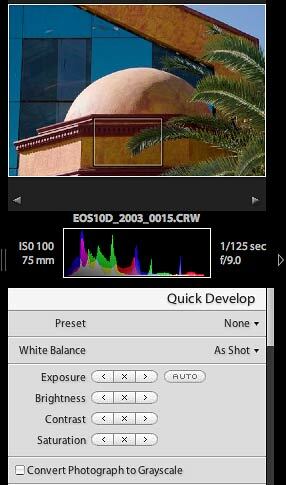 This tool is very powerful and enables me to eliminate some colour issues that even adjusting the Camera Calibration Profile doesn't fix. Black and White was another area that kept coming up amongst Photoshop CS2 beta testers, especially the desire to have true black and white editing tools within Camera Raw. Well, as we've already established the Develop module within Lightroom has Camera Raw at its heart. So, not only have we got the ability to convert our images into greyscale but we can also manipulate them in such as way as to mix colours thus creating effects such as Split Toning. There's really no way in the space available here to do justice to the Develop module. However, as one last taster of the features available I really must mention the ability to edit Camera JPG images. Yep, you read right - JPG! Just about every tool available for editing RAW images is available to JPG's. I must admit that when I first heard this I was aghast at the thought. I just couldn't believe that Adobe would waste their time on such a task, but they did, and man did they do well. Lightroom can also edit PSD and TIFF files, but the layers are not supported. The Slideshow module in Lightroom is a vast improvement on Bridge. On the left panel you choose the template to be used and on the right panel you configure how you want to show to appear. Some of the slideshow transitions are interesting but they also seem to require a fairly high end graphics card. Lightroom has three slideshow output options: Preview (the show appears in Lightroom window), Play (the show appears full-screen on your monitor), and Export (the show is saved to HTML, PDF or Flash format). 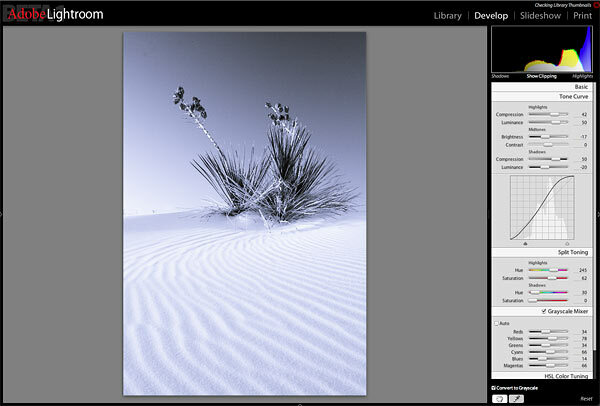 It's also possible to build web galleries within Lightroom but I've not had the time to test this feature. I don't propose to go into any more detail on the Slideshow because I would hate to spoil your fun. 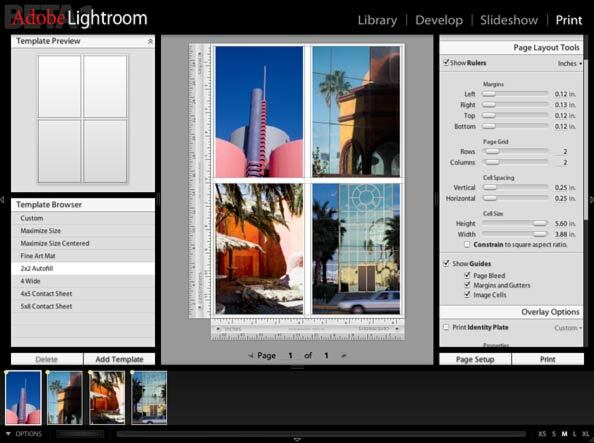 The last module in Lightroom is Print, which contains all of the Page Layout tools. In this module you can use predefined Templates to print single images, Contact Sheets or create and save your own Custom Templates. In terms of page layout the Lightroom print dialog is a lot more feature rich than it first appears, which is certainly a welcome advance on Photoshop. I did mention Photoshop, didn't I! With all its colour management settings we know that printing from Photoshop can be a nightmare for some. OK, so you're now thinking: is Lightroom any easier to understand? Well, it depends on what you mean by easy. Lightroom has two options for Colour Managing your prints: Managed by Printer and Other. In the case of Other you simply choose from the list of printer profiles in the ColorSync folder, pick the Rendering Intent (i.e. Perceptual or Relative Colorimetric). Lastly, but not to be forgotten is the Print Resolution and Print Sharpening feature. The default printer resolution is 360dpi but you can change it by simply clicking the current value and typing your preferred value (e.g. 240dpi). Likewise, the default sharpening value is Low but this is probably insufficient for anything bigger than 10 by 8 inch. Even though there's an option for Save and Save As under the File menu I've yet to find anything that activates them (both are greyed out and will probably vanish from the shipping product). So, when finished editing an image I simply choose Export. The Export dialog gives you the option to rename the image(s), choose the format (JPG, TIF, DNG), the pixel dimensions, and the ICC profile to be embedded into the image. The list of ICC profiles is rather short: sRGB, Adobe RGB (1998) and ProPhoto RGB. Alternatively, you can choose to continue editing the image in Photoshop. To do this you simply choose Edit in Photoshop CS2 from the Photo menu or hit the Cmd+E keys. Photoshop will launch, but be warned that the image when opened into Photoshop will be in the Adobe RGB (1998) colour space. I have not yet found any way of changing this. Last but not least are the ways in which you can have Lightroom appear on your monitor - hit the L key a few times and cycle through Lights Dim, Lights Out and back to Lights On. Then we have the try and trusted F key for cycling through the various screen modes. Editing an image in Lights Dim is a real joy for those who can't recall keyboard shortcuts because they can still just barely see the controls. Whilst on the subject of keyboard shortcuts I should mention that Adobe have decided to depart form many of the Photoshop/Bridge/Camera Raw defaults. This may cause you a bit of confusion at first but you'll soon get used to the changes. If you're too lazy to figure them it yourself then Adobe have a comprehensive list on their dedicated web site (see Conclusion for details). As I mentioned at the beginning, Lightroom is still very much unfinished. It would be easy to list features that I found missing or downright awkward to use but doing so would miss the point that Adobe are trying to make. So, whilst Adobe have certainly listened to users (me included) and tried to incorporate as many of the features that a Photographer working totally within the digital domain requires, they couldn't include everything. However, they're open to feedback. They want to hear your thoughts on what does and doesn't work, your ideas for additional features, your pain points, etc. I've tested Lightroom on my Apple PowerBook with a 1.33Ghz G4 Processor and 1.25GB of ram, a PowerMac Dual 2.5GHz G5 processor with 8GB or ram and a PowerMac Dual 1.25GHz G4 processor with 2GB. Apart from the time taken to import he images, etc it's quick, even on the PowerBook. Remember Rule 5 - Enjoy!